You’ve got a bunch of unused stuff lying around, don’t you? We all do, and you know what? It’s just sitting there—doing nothing, being nothing—when it could be turned into easy money! 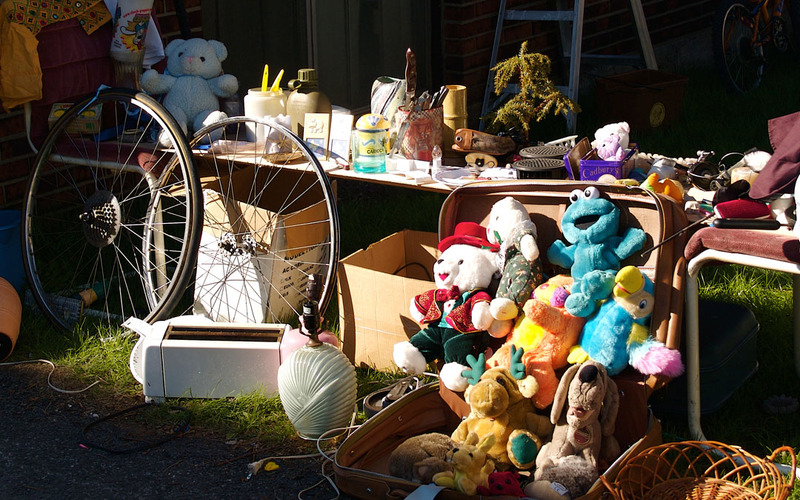 Did you know there’s an average of 165,000 garage sales every weekend, and they attract roughly 690,000 people? That’s not all: nearly 5 million items are sold every weekend, adding to up almost 4 and a quarter million in sales. That’s a lot of stuff out there waiting to be sold, and a ton of chances to make money. Feel like selling your stuff off now? Let’s get your garage sale started. Gone are the days of having to hang a sign at the end of your street (though you can still make those, too!). List your garage sale on craigslist, Kijiji and local message boards. An average of 95,000 garage sales are listed online every week. Serious buyers actually hunt for them online, then strategize on how to hit them all in a day. If you post it, they will come. Sort everything out, keeping similar items together for convenience. Boxes are great for organizing and acting as bins—and if anyone buys a lot, you can hand them a box to carry it all with them. Keep markers and labels on hand for listing (and in the afternoon, reducing) prices. Having a dispenser full of bubble cushion on hand is always a good idea for wrapping up fragile items after they’re bought. Money Tip: Don’t forget to have lots of loose change on the big day. Everybody pays in cash, and it’s guaranteed that someone will pay for a $4 sale with a $20 bill! Bargain hunters love to get an early start, so aim for a 7:00 am kickoff. It’s not too early, trust us. They’re itching to find the best items you have to offer. Hold your garage sale on a Saturday. People are excited to start their weekend, and they’re looking for a buyer’s high. Sundays tend to have diminishing returns due to it being a day of rest and the last day of the weekend. Also, Sundays tend to be when someone throws a second day for their garage sale, and there are fewer “good” items waiting to be bought. Bargain hunters know this. They’re called bargain hunters for a reason—they know how to sweet talk, argue and negotiate. They’re looking for a deal they can brag about, and if they can talk you down, they will. So, know what you want, know how low you’re willing to go, and then hold you ground. The better condition your stuff is in, the more money you can ask for it. If you saved its original packaging—and it’s in good condition, too—you can ask for even more. See? Tell your family you weren’t crazy for holding onto your Super Nintendo’s original box! Bargain hunters want (and deserve) a deal, sure, but you deserve a good return on your items, too. FYI: Some bargain hunters hit up garage sales just to find items worth re-selling online. The average profit margin for the right find at a garage sale is over 450% on eBay! So, are you amped to starting throwing some garage sales over the summer? We thought so. Start gathering up your stuff, list your sale online, and wait for the cash to roll in. We’ll see you on Saturday!